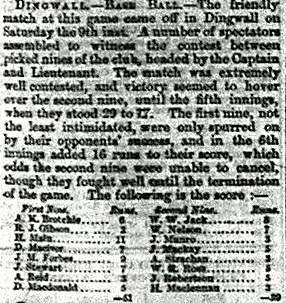 With sincere thanks to Inverness Reference Library, I now have a digital copy of what might well be the first box score to ever appear in a British newspaper (the Inverness Advertiser, 19 July 1870). In addition, a cutting from the same paper on 18 April 1871 confirms that the club survived at least one Scottish winter. The cutting is transcribed below, followed first by the scan of the box score from 1870, and after that with the transcribed box score. For details, and an ensuing comment thread, relating to the initial finding, please click here. At a meeting of the Dingwall Base Ball club held on Tuesday, the 11th inst., the president was re-elected, and the following gentlemen appointed office-bearers, viz. :—Mr J. Stewart, vice-president ; Mr W. W. Jack, captain ; Mr H. Main, lieutenant; Mr D. Madonald [sic], secretary ; and Mr R. J. Gibson, treasurer. Messrs A. F. Sutherland, J. Robertson, and A. Strachan were appointed members of the committee. It was agreed to commence play for the season on Monday the 24th curt., and after awarding a very hearty vote of thanks to the late captain, Mr A. K. Brotchie, who proceeds to America, the meeting adjourned. First Nine. Runs. Second Nine. Runs. 2 Responses to Back to Dingwall: the first British box score? This page contains some notes by Sandy Thomson about sport in Dingwall in the 1860s onwards: http://www.spanglefish.com/cromartyhistorysociety/index.asp?pageid=143615. No mention of baseball though.